Canada's Grand Prix track is one of the calendar's best stops, not so much for the challenge of the track as for the all-round appeal of the venue. 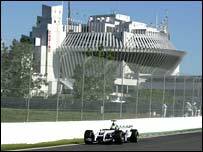 The Circuit Gilles Villeneuve - named for the late, great Ferrari star - is no huge test for the drivers. But its combination of straights and slow corners often provides fast, furious, action-packed racing. And Montreal, an atmospheric blend of North American and European culture, is a charming and exciting place. The movie is 340k and should take no more than 2 minutes to download over a 56k modem. If the guide appears to be running slowly try closing down any other applications you may be running. If the guide becomes unresponsive click anywhere within the guide area. Click here to go to our help page if you have any questions or problems about using the Flash plug-in.